Extremely large files are a problem, but File Splitter and Joiner has the solution. 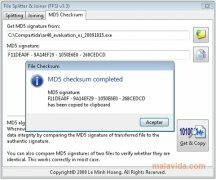 If you want to divide a file because you need to send it by email and your service doesn't support transfers that are so large, or if you want to split a file to burn it on several discs, this software is exactly what you need. 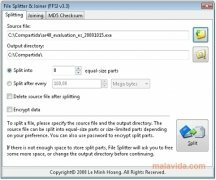 File Splitter and Joiner is an application that integrates into Windows to be able to be launched from the context menu to divide the file that you choose, in the same way that all the parts of a file can be joined from the same menu. 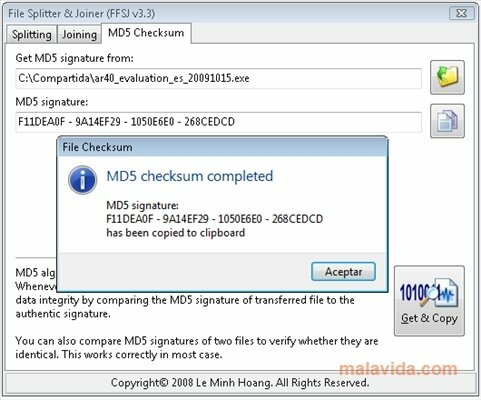 As logical, File Splitter and Joiner allows you to select the number of parts that we want to have, and the maximum size that each part can occupy, in such a way that it's possible to divide the files in many parts as a security precaution, or in very small parts to make them fit on a diskette. On the other hand, it is also possible to encrypt each part and even to find out the MD5. The most common use of this kind of application takes place when we want to upload files to a server or send them by email and the files are too large. With this software we'll be able to solve both of these problems.